Well, got some worrisome news. If you recall, there was some speculation about Drew’s worsening heart condition immediately prior to the leg surgery. Speculation that prompted us to schedule a consult with Drew’s local cardiologist (well, “local” is relative…Drew’s regular cardiologist is in Nashville). Drew’s specific problem is Aortic Valve Regurgitation, a condition where the valve doesn’t close tightly allowing blood to leak back into the heart instead of pumping it out into the body. This condition was treated, along with a hole and some narrowing of his aortic valve, during his open heart surgery though it couldn’t be fully repaired so Drew has been taking medicine twice daily since. He has been continuously followed by a cardiologist since to monitor the regurgitation. We’ve had some ups and downs, but such is the life when managing a heart condition. Well, his regurgitation has slightly worsened and his heart chamber has slightly increased in size (to compensate for the extra volume of blood). Not so much that additional surgery is an obvious choice, but inevitable at some point. The question is just when will it be most appropriate? So, we must wait a week until the staff can fit Drew’s case in during a conference with surgeons to determine the best course of action, whether it be surgery now or surgery next year or a few years from now. I don’t know much about exactly what or how they are going to do it, but we are looking at a valve transplant. If they move forward with surgery immediately, he could be released for his leg surgery six to eight weeks from the heart surgery. If they don’t move forward, then it will be additional time that this mama has to worry and think about his malfunctioning heart. I realize that a team of surgeons would never consider not doing surgery if it wasn’t risky, but you mothers out there must understand how hard it is to even think there is wrong with your child. And, even if doctors don’t worry about it, it’s always on our mind. And, when in matters of the heart and the brain (I can only imagine), I think the anxiety is even harder to not obsess about. So, now we must wait for the final call. Ugh…waiting for test results, never a good time. In other news, we took advantage of the Morganfield Elementary School open house on Wednesday to bring Drew to the school to see everybody and he got a warm welcome from the crowds of parents and kids. 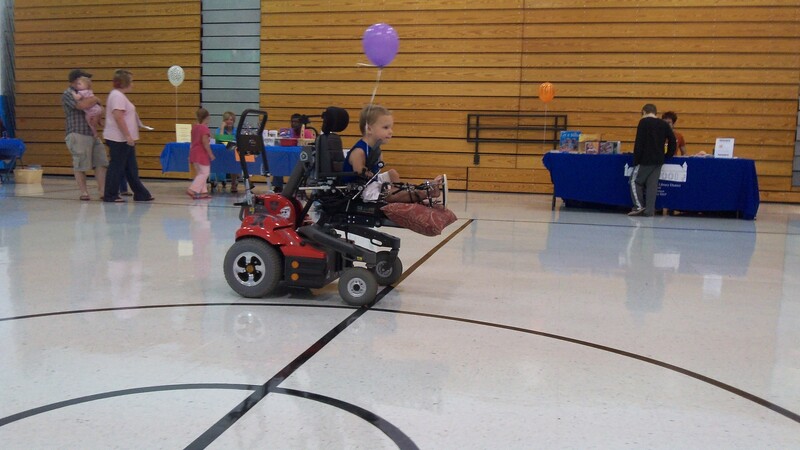 “DREW!” they hollared when he wheeled into school in his wheelchair. I think kids were really surprised to see his leg never really understanding what this whole process really meant. And, even though the preschool class, including Ms. Lisa weren’t present, Drew had a great time. He collected a lot of pencils, gave a lot of high fives, and had a great time seeing everybody again, even showing off how he could stand and walk for a lot of people. Drew got to enjoy some additional time playing with his buddies last night with the neighbor’s kids. 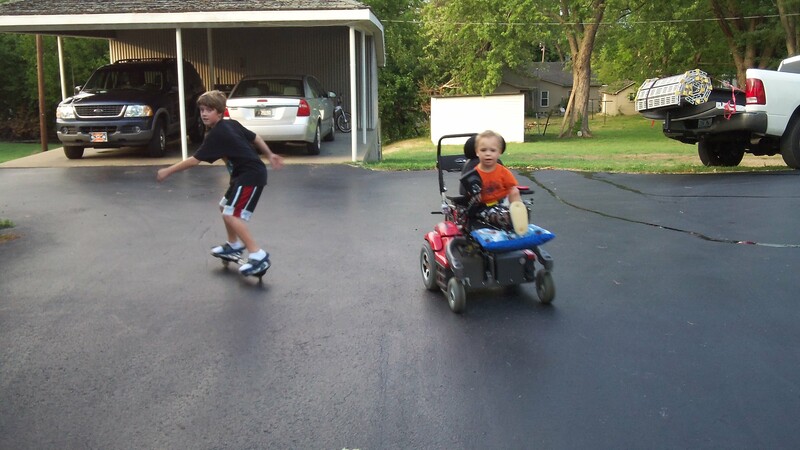 They all raced each other, Drew in his wheelchair and one on this skateboard thingy. The younger ones going old school and just running. There were a couple of minor collisions as a girl, pegged to be life’s “most likely to be in a full body cast at least once in life” by her loving mother, collided with the wheelchair ending up with her toes trapped under Drew’s back tire. But, she took it like a “man” and had no complaints. Then, shortly thereafter Drew t-boned her younger brother cruising around in his cozy coupe. Both were total accidents so I wasn’t mad. But, Drew realizing that he had inadvertently kicked the cozy coupe’s driver in the chin, felt terrible and immediately apologized and then solemnly drove off with his “tail between his legs.” I had to grab Drew and reassure him that things were OK and nobody was mad. But, it was nice to see that Drew has a genuine conscience and care for his fellow men. Drew also started therapy at the Union County Methodist Hospital in Morganfield. Drew’s been a few times and so far he’s a lot more cooperative than in the past. The staff love him (of course) and we are happy to see Drew getting his exercise and stretching those muscles. In fact, he’s just woken up from a good night’s sleep and requested to go to physical therapy. Don, his physical therapist in WPB, will NEVER believe this story. Last night, Nate and I prepared for a yard sale, pricing items, cleaning things up for purchase. As you can imagine, having a child as cute and charming as Drew, we have accumulated a lot of toys over the short four years. And, when new ones came in, we stored old toys into closed boxes in unused rooms to be forgotten about. Re-opening the boxes to mark the contents for sale brought back a lot of memories. Some of Drew’s first toys made their way into my hands as I touched each of the buttons and nostalgically thought about Drew playing with this very button when he was a baby. 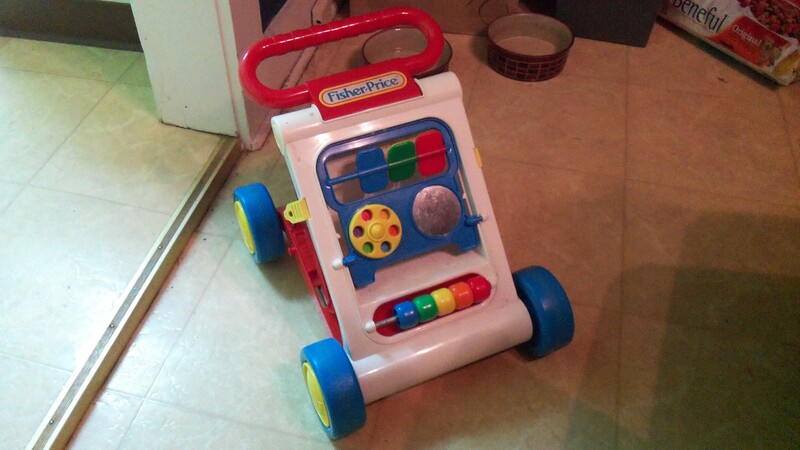 I recalled memories attached to each toy, but no toy brought back as many memories and emotion as a close-to-antique Fisher Price toy walker I had completely forgotten about. I tried finding some old pictures of Drew running around on this thing and I couldn’t find any. I very disappointed in myself. It was the first toy that Drew used to “walk.” We adapted the walker to fit him and around two years old, he would run on his knees from room to room with the rhythmic clicking of the toy’s wheels and the noise of the plastic wheels on the wooden floors is still something I remember. And now, he’s twice (or more) the size, age, maturity and has already been through a lifetime of experiences. And, here we are on the verge of a true walk, of a huge change – the biggest – in his life and he’s getting farther and farther away being my baby boy. Even though he’s only four, I kind of feel that what we’ve been through as a family has accelerated our lifetime. So, I just try to enjoy every moment and not take advantage of any time with Drew because even though only four years have passed, it feels twice as fast and four years from now, as he walks into his 2nd/3rd grade class, as crazy as this sounds, I’ll even be fondly remembering this crazy year. Previous Post A Million Pennies for Drew! OUR THOUGHTS AND PRAYERS REMAIN WITH YOU, NATHAN AND DREW.